EChannel is a powerful audio engineering channel strip that includes a routable gate, a powerful parametric EQ, a versatile compressor and an output transformer simulation. EChannel is optimized for efficiency and delivers legendary Eventide effects on multiple tracks at once, without sacrificing sound quality or taxing your CPU. EChannel’s modular design supports flexible signal processing routing making this a perfect tool for tracking and mixing any genre of music. 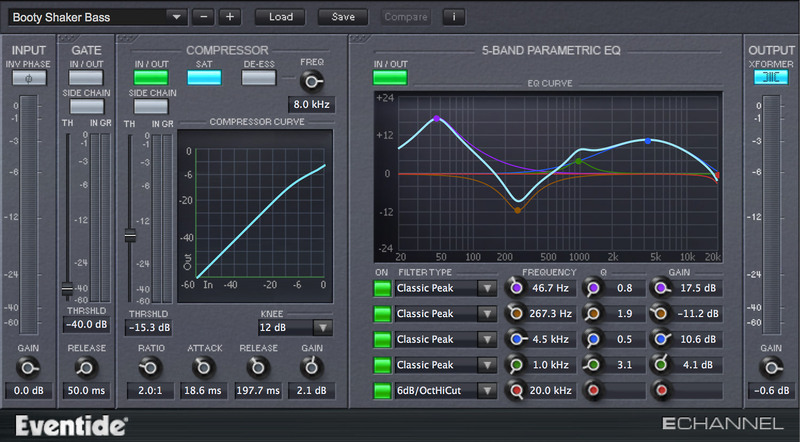 Want your compressor after your EQ? No problem, just drag and drop it in the order that suits your sound. EChannel’s graphical displays and its suite of controls give you a near infinite number of ways to dial in the exact tone and frequency characteristics you’re seeking. Side-chaining allows you to use an alternate audio or control source to color your sound. Currently the EChannel plug-in is only available to those who own Anthology XI or who are Ensemble susbscribers.